The Dillon Garden Club was delighted to offer an “Afternoon with Nick Townsend” at the home of Susan Newton on Tuesday, March 21, 2017. 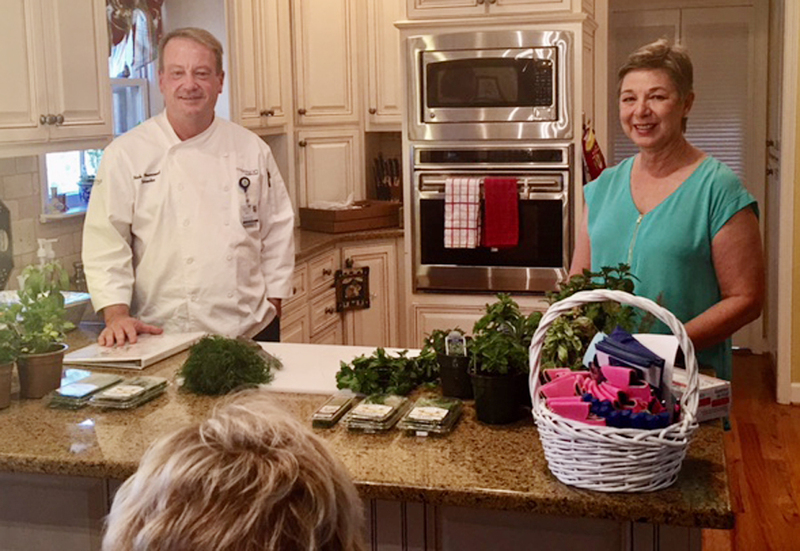 After a brief business meeting, Nick, who is the Director of Food Nutrition Service for the Carolinas Hospital System, presented a program to most of the garden club members along with two visitors. His presentation was full of information, instruction, and entertainment. He began by educating us on the methods of choosing, growing, preparing, and storing herbs. His talk included explaining how to best use herbs in food preparation including when it is best to add them during cooking and which ones are best paired with what foods. He told us how to dry and freeze herbs, how a recipe should be modified if substituting dried for fresh herbs, how and where to grow different popular varieties, and how to experiment with amounts to best suit your pallet. Nick suggested some of his favorite cook books and presented door prizes including a gift certificate to the Forest Lake Greenhouse which was won by Patti McInnis. After he finished his presentation, he prepared a four-course meal for us: spring mix salad, sour cream and herb potatoes, chicken with butter and herbs covered with cream cheese sauce, and rosemary brownies with chocolate can ache. The meal was served with mint tea. Imagine, after presenting a wonderful program and treating us to a gourmet meal, how excited we were to have him play the piano and serenade us! It was like going to a fine restaurant on a night when there was live music! Everyone is already excitedly looking forward to his promised return visit next fall.